"The Portrait of Lady Anne" is a primitive one-reel production from Thanhouser and typical of films of its day in most ways: plotted in the tableau style where title cards announce proceeding action, straightforward camera framing, actors conveying emotion through broad gesticulation and an even more obvious and simplistic moral of the story (jealousy is regrettable). Yet, the device of a portrait here that comes to life, along with the double narrative of two generations of Lady Annes, is an interesting concept full of self-reflexive cinematic possibilities. In this way, it's similar to "The Evidence of the Film" (1913), which is probably the best Thanhouser picture I've seen. There's the framing of the first story, by portrait here and by film in the latter, where a mistake is made and which, in a way, is corrected by the replaying of the story in another format--by projecting the film in the latter and here by Lady Anne's descendant initially making the same mistake, which Lady Anne's portrait corrects by coming to life--the portrait projecting. 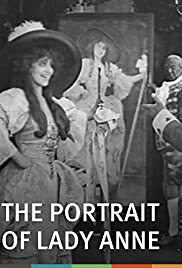 Both films feature the same actress, Florence La Badie, in the pivotal part, as the editor in "The Evidence of the Film" and in doppelgänger dual roles here. By the portrait coming to life, it references film and, indeed, motion pictures have been called by various names throughout the years such as "living pictures" or "portraits." There's a superimposed mise-en-abyme of Lady Anne's thoughts of her dying former beau in one scene, as well, and a couple other camera tricks (multiple-exposure shots and a stop-substitution disappearance) that lend some visual support to the narrative's reflexivity. One shot also features La Badie in the foreground outside a window, which frames the background characters inside, like a painting. And the final scene is reminiscent of the balcony scene from "Romeo and Juliet." It's also interesting to view a doppelgänger theme that isn't in opposition to a character and is employed in a picture that isn't of the Germanic variety, for a change, including its early use in the later "The Student of Prague" films (1913 and 1926), or in the adaptations of the English-language Gothic horror kick I've been on recently, including Dracula, Frankenstein and Jekyll/Hyde. Speaking of which, I came to this film after reading "The Picture of Dorian Gray" and seeking screen adaptations of it, the first of which is available being made by Thanhouser three years later. "The Portrait of Lady Anne" doesn't really have anything to do with Oscar Wilde's tale, but it similarly features a changing portrait that influences the protagonist's life and contains some interesting cinematic reflexivity.